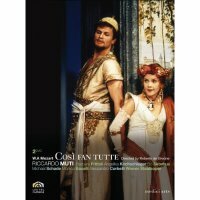 Opera on DVD went from strength to strength during the past year. There have been a number of sensational new works on the medium and chart-topping productions of standard repertory. This 1996 staging from Vienna’s historic Theater an der Wien can be safely recommended as a first choice for both seasoned collectors and newcomers to the work. With an excellent cast of motivated soloists, superb conducting from Muti, marvelous sets (Mauro Carosi), gorgeous costumes (Odette Nicoletti) and musically informed stage direction, this is the version to have and to return to. In every respect it surpasses Muti’s 1989 Milan performance (Opus Arte/Scala).